After the introduction of liposuction more than 30 years ago, patients began to have their thighs, buttocks, abdomens, and arms selectively contoured to rid themselves of “saddlebags”, large buttocks, abdominal bulges, and hanging arms. In a relatively short time, liposuction became the most commonly performed surgical procedure in the United States, and perhaps in the world. As liposuction developed in the late 1970s to mid 1980s, a new problem arose: the post-liposuction iatrogenic deformity, or, in laymen’s terms, new dents and irregularities caused by overly zealous or badly performed liposuction. Any patient who has liposuction may end up with liposuction’s most common complication: superficial surface irregularities. Some of these are exaggerations of preexisting irregularities, some are cellulite, and some are newly created. The thighs, arms and abdomen are particularly prone to irregularities. Such irregularities are so common that many physicians have come to accept defects from liposuction as acceptable outcomes. 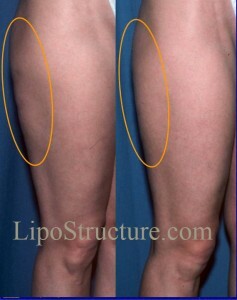 Patient presented after liposuction to her outer thighs and buttock creases (above). The resulting creases in her lower buttocks, which extend out to the outer thighs, interrupts the continuous flow of her buttocks into her thighs, and makes her buttocks appear to sag. However, post-liposuction deformities are not just limited to visible skin surface irregularities. Changing the relationship between a woman’s thighs, hips, and abdomen, for example, can result in unnatural and even bizarre proportions. For instance, a dramatic decrease in the size of a woman’s lateral thighs (saddle-bag area) without an appropriate decrease in waist size can result in a “boxy” and even masculine appearance. Flattening the lower abdomen without attention to the upper abdomen can add to this “boxy” appearance as well. Minor reductions in the volume of the buttocks and/or lengthening and deepening of the buttock creases with liposuction can interrupt the continuous flow of the thigh into the buttock. Such maneuvers by surgeons often create a buttock that would be considered unattractive if it had occurred naturally. In 1987, Dr. Coleman began treating liposuction deformities with fat grafting, primarily focusing on the surface irregularities. As he became more proficient at fat grafting, he began to address body proportion to restore a more natural, aesthetic appearance and to reestablish a feminine relationship between waist, hips, and thighs. Now, of course, as liposuction has become more popular for men, we see male patients with post-liposuction irregularities of the abdomen, lovehandles, back and even chest. These defects can be corrected as well. In order to correct liposuction deformities, of course, more liposuction must be performed. We need to harvest fat to fill in the defects. It is particularly important to try to avoid creating new problems when removing fat to use for the correction of the existing liposuction defects. This requires careful diligence and attention to detail of a surgeon experienced in this type of repair work. Two views of a patient with over-suctioning of the hips, upper, outer thighs and buttocks (left) and 10 months after correction by Dr. Coleman (right). Not only are the irregularities smoother, but her body proportion now reflects a more feminine, healthy appearance.